Elliott Bay Design and Bauer Interiors Create A "Prince"
When a naval architect and interior designer sit down to design a commercial vessel, they must blend together a multitude of considerations that delicately balance form and function. The naval architect's job is to ensure that the vessel meets a variety of government safety regulations and marine engineering codes, from ADA compliance to Coast Guard fire protection. The interior designer arranges colors, lighting, fabrics, and finishes in such a way to ensure the owner realizes that their needs are met with the final product. "There are several phases in the construction of a vessel, and in each one the most critical element to the success of the project is the interaction of the naval architect and the interior designer," said Grace Bauer, president of Bauer Interiors of New Orleans. "All communication is shared, reviewed, reworked, revised, and then forwarded to the owner for review. Discussions can be continuous and lengthy in order to understand an owner's needs and desires, as well as budget and regulatory issues." In most cases when the owner is a government entity, both the naval architect's and the interior designer's choices are limited by budget constraints. One notable exception when both architect and designer were able to combine their skills to achieve a higher-than-usual level of comfort and safety occurred when residents of Prince of Wales Island commissioned their own car ferry. Prince of Wales Island, the third-largest island in the United States, was accessible only by small aircraft, floatplane or an infrequent car ferry operated along the Inland Passage by the Alaskan highway system. 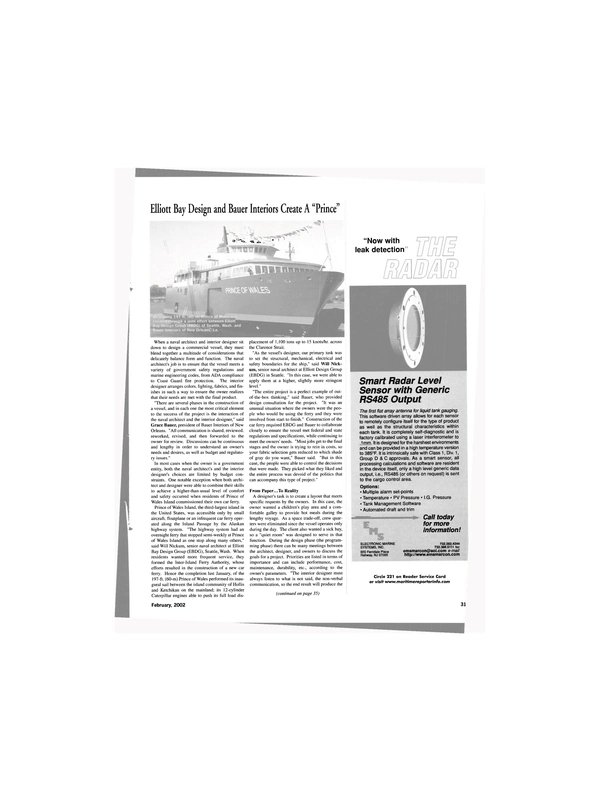 "The highway system had an overnight ferry that stopped semi-weekly at Prince of Wales Island as one stop along many others," said Will Nickum, senior naval architect at Elliott Bay Design Group (EBDG), Seattle, Wash. When residents wanted more frequent service, they formed the Inter-Island Ferry Authority, whose efforts resulted in the construction of a new car ferry. Hence the completion last January, of the 197-ft. (60-m) Prince of Wales performed its inaugural sail between the island community of Hollis and Ketchikan on the mainland; its 12-cyIinder Caterpillar engines able to push its full load displacement of 1,100 tons up to 15 knots/hr. across the Clarence Strait. "As the vessel's designer, our primary task was to set the structural, mechanical, electrical and safety boundaries for the ship," said Will Nickum, senior naval architect at Elliott Design Group (EBDG) in Seattle. "In this case, we were able to apply them at a higher, slightly more stringent level." "The entire project is a perfect example of outof- the-box thinking," said Bauer, who provided design consultation for the project. "It was an unusual situation where the owners were the people who would be using the ferry and they were involved from start to finish." Construction of the car ferry required EBDG and Bauer to collaborate closely to ensure the vessel met federal and state regulations and specifications, while continuing to meet the owners' needs. "Most jobs get to the final stages and the owner is trying to rein in costs, so your fabric selection gets reduced to which shade of gray do you want," Bauer said. "But in this case, the people were able to control the decisions that were made. They picked what they liked and the entire process was devoid of the politics that can accompany this type of project." From Paper...To Reality A designer's task is to create a layout that meets specific requests by the owners. In this case, the owner wanted a children's play area and a comfortable galley to provide hot meals during the lengthy voyage. As a space trade-off, crew quarters were eliminated since the vessel operates only during the day. The client also wanted a sick bay, so a "quiet room" was designed to serve in that function. During the design phase (the programming phase) there can be many meetings between the architect, designer, and owners to discuss the goals for a project. Priorities are listed in terms of importance and can include performance, cost, maintenance, durability, etc., according to the owner's parameters. "The interior designer must always listen to what is not said, the non-verbal communication, so the end result will produce the vision the owner has of his project," Bauer said. "The architect provides the boundaries for determining how comfortable the seats can be, the distance between chairs, room sizes and passenger capacity." Together, the naval architect and interior designer then begin the space planning process, taking into account the cost parameters and the timeline allotted for the project. At this point, the owner reviews their compromise and the tweaking process can begin, with decisions based on the initial phase's priorities list. According to Nickum, the direct lines of communication between the ferry owners and the designers vastly contributed to the job's success. During the design and development of the Prince of Wales, the owners had clear ideas of what they wanted. "They were refreshingly practical," Nickum said. "They gave a lot of thought to what they wanted because they were the ones who would be using the ferry. Our job was to help them achieve their goals while complying with safety issues. As it turned out, we were able to comply with Coast Guard regulations for a larger class vessel that involved more stringent regulations." "The more stringent regulations we decided to use addressed insulation and combustible surfaces," Nickum said. "So we worked with the interior designer on surface finishes such as non-combustible carpet." "The overhead ceilings had to be non-combustible; we couldn't even use the fibrous kind such as the acoustic panels you find in drop ceilings." Bauer complied by choosing a metal drop ceiling, and presented several different color schemes to the owners, choosing bright tones and shades to lighten up the gray winter days. EBDG's Nickum also increased fire protection to comply with Coast Guard regulations for a Subchapter K class vessel. Extra firewalls were installed, and thicker insulation was integrated into the layout. "The 150-passenger capacity actually qualified the vessel for a smaller class - Subchapter T - but the fact that it was so big and it was a car ferry heightened the risk factor enough that we wanted to bring the safety up a notch," Nickum said. EBDG also made sure that the vessel was ADA compliant. An elevator was added and passenger areas offer tables without fixed seating to allow for wheelchair access. Other features include ramps at door sills enabling access to the solarium; the elevator landing features ramps built up from the deck level to allow wheelchair without rolling over bumps or curbs; the washroom sinks have no cabinets to allow for wheelchair access, and ADA accessible stalls offer support rails. Visual alarms also supplement tone alarms for the hearing- impaired. All counters and drinking fountains are wheelchair accessible and there is reserved seating in all passenger travel areas. Once all the priorities have been identified and addressed, the project moves into the design development phase. "During this phase, the basic plan — size, budget, etc. — becomes hard and fixed for approval by the owner," Bauer said. For the Prince of Wales, Bauer added reclining chairs in the forward observation lounge, computer carrels in a port reading room, and electrical outlets for motor coaches or an ambulance on the ground level.